Finns attack Earth in April. It happens with a €7.5 million budget black-humored scifi movie, Iron Sky, staring Nazis and Sarah Palin and possible Dr. Strangelove set together by Finnish Timo Vuorensola also behind collaborative film-making site Wreckamovie. According to The Independent 1 million of the budget came from Internet donations. Although the movie has some known faces, Udo Kier and Bond villain Götz Otto, most seem little known, Stephanie Paul playing a main character not even yet on Wikipedia. The strangely haunting Under The Iron Sky by “Adamantium Studios Feat. Kaiti Kink” is also worth mentioning. The people behind the song are apparently Tapani Siirtola with Joonas Naskali. Note, on the starwreck forum the director asks about whether they should use the song in the movie. It is interesting to see the well-hyped partly collaborative approach. Whether the movie is actually good and reaches its high expectation is another story. But collaborative film-making from the Finns is worth following. This entry was posted in art, culture, society. According to a testimony given after the war by Hans Frank, Adolf Hitler’s lawyer, Hitler was blackmailed by his nephew, William Patrick Hitler. According to a book by David Lewis the William Patrick also published this story before the war in the 6. August 1939 edition of Paris Soir. Hans Frank said that Hitler’s father’s mother, Maria Anna Schicklgruber, worked for a Jewish family at the time when her son was born, a Jewish Frankenberger family in Graz. Wikipedia writes presently that historians dispute this and claim inaccuracy in the Frank story. In 2010 Belgian Knack published a story on Hitler’s ancestry. This was circulated in the international press, e.g., The Telegraph, Huffington Post and Austrian Times. See also the web-version of the Belgian story and translation. According to the story Belgian journalist Jean-Paul Mulders with the help of historian Marc Vermeeren tracked downed a “Norbert H” and 39 other Hitler relatives in Austria. Norbert H gave a saliva sample that could be DNA’ed. According to the reporting they also managed to obtain DNA from Hitler’s grand-nephew, Alexander Stuart-Houston, by tracking him down, following him and stealing a napkin he had used. There is some strangeness with the story. The Telegraph writes “A chromosome called Haplogroup E1b1b1”. Now Haplogroup E1b1b1 is not a chromosome. The original Belgian article writes “haplogroep E1b1b”. These haplotypes are not quite the same. Perhaps a typo? The haplotype is on the Y chromosome meaning you only inherit it from your father. If one look on Wikipedia’s Hitler family tree there are not that many father/son relations in the line of Hitler: Hitler’s father, Alois Hitler, got two sons: Alois Hitler, Jr. and Adolf Hitler. Adolf Hitler had no surviving brothers. Alois Hitler, Jr. had two sons: the nazi Heinz Hitler, that died on the East front and the possible blackmailer William Patrick Hitler that emigrated to the US. William Patrick Hitler had apparently four sons: Howard Stuart-Houston (1957-1989), Alexander Stuart-Houston (1949), Brian Stuart-Houston (1965), Louis Stuart-Houston (1951). These three surviving grand-nephews seem to be the only ones that could provide Y-DNA for the investigation of who Adolf Hitler’s father’s father was. Penetrating the haplotype scientist nomenclature is a pain. The Wikipedia page on Haplogroup E1b1b (Y-DNA) is of some help. The Hitler Y-DNA study was apparently made by Ralf Vermeulen. But trying to seek on that name does not help to get further detail. Another article states that the Austrian and the American sample match on the Y-chromosome. If the Austrian group is on the Johann Georg Hiedler line then it means that Adolf Hitler’s grandfather was the one formally stated as his grandfather, and not a jew. So does that mean they all have E1b1b? Unclear. These days media are pushing a new story originating from French Le Point apparently on Adolf Hitler secret possible son, Jean-Marie Loret. Loret has enlisted University of Heidelberg to do some tests. But they are apparently not DNA test, but rather “physionomie comparative”, a test on “groupe sanguin” and graphology tests. The Le Point article links some documents, but to me they show nothing of importance. Some news sources claim that Jean-Paul Mulders already has compared Hitler line DNA with Loret and concluded they were not related. So the Jean-Marie Loret story seems to be a silly fluke in the media. It leaves us with E1b1b. I find it interesting that one scientific blogger can make more telling comments that a whole line of churnalists. It is possible that the case is better documented in the paid version of Knack and the web reporting are simply not summarizing the results good enough. So much trouble for one line in Wikipedia. So I got an email from an apparently friendly person asking whether she could translate and use content from our server neuro.imm.dtu.dk “looking forward to hear from me”. I replied yes you can use it under a CC-BY-SA license which she didn’t quite understand. No, Jennifer. I will not do that. Neither tiny link nor big, – nor medium for that matter. I am confused: It sounds – to me – as a new kind of elaborate search engine optimization. The neuro.imm.dtu.dk runs Debian and was on oldstable Lenny which is unfortunately running out of security updates so it was pressing to update to stable Squeeze. I edited my /etc/apt/sources.list and pressed the big “aptitude dist-upgrade” button. I got a “Possible missing firmware /lib/firmware/e100/d102e_ucode.bin” issue which “aptitude install firmware-linux” apparently solved. Phew. The computer is very old running lilo, and it now has a problem with booting. It wants to look at the floppy drive. F1 and a manual selection in the lilo menu gets it up and running. Maybe this has something to do with the root device ID that needs to be passed as a kernel parameter? I am unsure how to upgrade to grub. I made the installation overwrite the /etc/mime.types with the distribution version loosing the “image/x-nifti-1 nii” line. With that line setup again I can serve the Nifti neuroimages from the Brede Wiki to client fslview or Chris Rorden’s MRIcron, see Eye muscle proprioception is represented bilaterally in the sensorimotor cortex on the Brede Wiki, where there are volumes linked. After the upgrade of the system I wanted to go from an old version of MediaWiki installed outside the distribution system to the newer distribution-provided 1.15 MediaWiki. I installed the MediaWiki with “aptitude install mediawiki mediawiki-extensions mediawiki-semediawiki” which went without problems. However the associated database upgrade and reconfiguration are harder. “php5 maintainance/update.php” almost worked. I ran into a GRANT issue getting an error. With “mysql -p wikidb” and the mysql command “GRANT ALL PRIVILEGES ON wikidb. * TO ‘wikiuser’@’localhost’ IDENTIFIED BY ‘password’ WITH GRANT OPTION ;” might have solved it. At least executing the update.php script the second time completed. I copied my old LocalSettings.php to /var/lib/mediawiki rather than /etc/mediawiki, not sure why the other thing didn’t work. I enabled ParserFunctions, Cite, Graphviz extensions that where available in the distribution. OpenStreetMap extension SimpleMap seems not to be available in Debian so I copied the old version. I also copied the images to /var/lib/mediawiki/images and made new aliases in /etc/apache2/sites-available/default. I installed ConfirmEdit extension and perhaps need to look into ReCaptcha as I am struggling with spam and “$wgSorbsURL = ‘http.dnsbl.sorbs.net.’;” not working much. I would also like to enable some Table rendering. At the moment tabulator- and comma-separated material is rendered poorly (as poorly as before the upgrade) in the wiki, see, e.g., an example on the Brede Wiki. There are some extensions that I didn’t get to work well with the old version of MediaWiki. A sortable table would be nice. Now the inclusion template just uses “white-space:pre; font-family: monospace;” style for the entire csv page. I am presently reading the popular science book Living with our genes: why they matter more than you thing, – a book about behavior genetics by Dean Hamer and Peter Copeland. So far I have reach chapter 1: “Thrills: getting high on life”. There researcher Hamer and writer Copeland recount research on exploratory behavior, novelty seeking, Parkinson’s disease and dopamine. The bottom line is that the D4DR gene says something about the probability a person will be a high or low novelty seeker, but it alone is not enough to predict the score. Working with personality genetics in the Brede Wiki for Personality Genetics I am more pessimistic. A 2008 meta-analysis shows that the specific genetic variation examined in the 1990s (DRD4 Exon 3) may have zero effect. Another variation in the gene (C-521T) has though showed some effect. This is also what I see in my database with the few studies I have entered. Another issue issue noted by Hamer and Copeland is a relation between Parkinson’s disease and novelty seeking: patients are thought to have lower novelty seeking score than normal control subjects. I have now entered a number of such studies in the Brede Wiki. The meta-analysis on the correlation between Parkinson’s disease and novelty seeking has shown an effect. The support for the hypothesis is not unequivocal though. There is now a fair deal of variation between the studies. 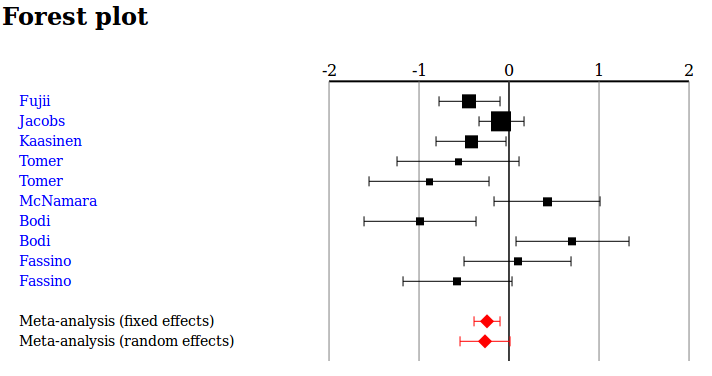 The p-value for the heterogeneity is way low and the confidence interval for the random effects meta-analytic effect sits around zero (see plot). This could be due to different/no treatments of the patients, which I haven’t examined further. My opinion is that one should be careful about giving strong statements in this behavioral genetics field. Effects which were clear in initial studies may dilute with further studies. This entry was posted in science and tagged Brede Wiki, dopamine, genetics, metaanalysis, noveltyseeking, parkinsonsdisease, personality.